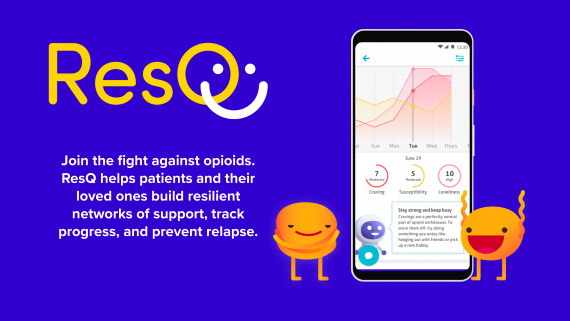 Resilience IQ (ResQ) promotes recovery from opioid addiction by mobilizing a user’s social network—with precision—when their help is needed the most. Social support is a key driver of long-term abstinence, yet it continues to be an area that is lacking for many individuals in recovery. Individuals in support roles often don’t know how to support their loved ones, while many individuals in recovery don’t know how best to engage their support networks. ResQ connects users in recovery to their loved ones and takes the guess-work out of when and how to provide support. Using ResQ, recovering individuals record their progress by completing simple activities that research has shown can predict if they might use opioids in the future. Over time, this data is used to identify the critical moments when an individual is most vulnerable, as well as the features of their vulnerability, such as whether they are feeling lonely, stressed, or showing signs of risk-taking behavior—some of the key early warning signs of relapse. By identifying the time and circumstances of a user’s vulnerability, ResQ can mobilize social support in a precise manner by suggesting actions to take in response to specific observed events and expected future events. ResQ’s design is centered first on the recovering user, with the goal of empowering them to create the resources they need to stay abstinent over the long-term. ResQ makes it fun and easy for the user to record their status, providing them with access to “gold-standard” clinical instruments that we’ve adapted to play like video-games—without sacrificing their scientific integrity. ResQ provides the user with a digital assistant who responds to their condition like a therapist or mentor, applying techniques derived from psychology practice. ResQ takes the user’s privacy seriously, ensuring that they are always in control of how and with whom their data is shared. ResQ is also designed with support users in mind. We understand that supporting a loved one through recovery is a new challenge for most individuals, so we’ve designed the app to provide skills and tools that supporters need to be confident and effective. Supporters are provided with advice on how to interpret their loved one’s status from the data, and how to respond. ResQ goes beyond previous mobile-based support services by intervening with personalized evidence-based suggestions at critical moments in the recovery process, and by sharing these with a user’s friends, family, mentors, and counsellors to create a more permanent and meaningful source of support. We hope that by using ResQ, families who have been affected by opioids can come together, and together build resilient networks.